We have just completed a framing a family heirloom that has been held onto for nearly a century. A couple brought in this old confirmation dress along with some small photographs they wished to have framed. The woman was kind enough to share her story. 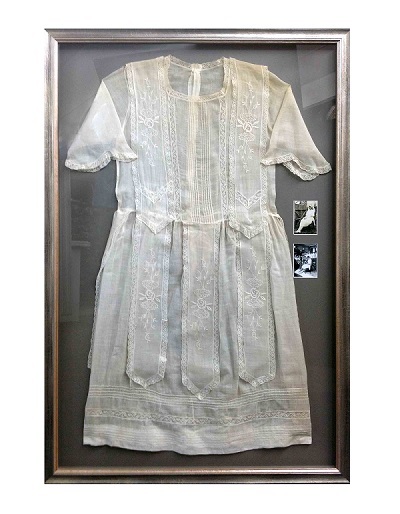 This beautifully delicate dress, lined with lace, was used as a confirmation dress by her mother. She showed us the photograph of her mother, as a girl, wearing the dress on her special day. Years later, when it was the woman’s turn to be confirmed, she wore her mother’s dress, and re-created the photograph by posing in it the way her mother had done. The dress was aged, having weathered a significant period of time. And the delicate nature of the material meant the dress would not likely last for another wearing. Instead the woman wanted to frame the dress to preserve it, transforming it into a keepsake that could stay in the family for many years. A contrasting colour was picked for the background. Cream colours and beige matting tended to make the dress disappear. This darker background allowed the fine details of the garment to become the focus. The dress was carefully steamed and selectively ironed to treat the wrinkles, and was then pinned to the mat with conservation techniques. The photographs were quite small for such a large frame. The framer kept them together so they would not be dwarfed in scale by the dress. Pairing the two also allows the viewer to glance from mother to daughter and back again, and marvel at how the similarities between these women are striking. 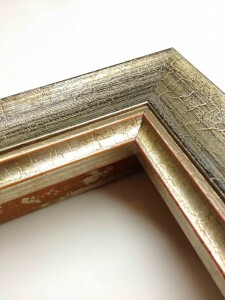 The frame was a crackled, warm silver. It has elements of a more traditional frame, with the detail on the inner lip, but at the same time has a sleek contemporary mould. It is a frame perfectly suited for the piece. A bit of the past paired with a bit of the present. Thank you so much for allowing us to work with your special item.